← Pontianak and the Equator. 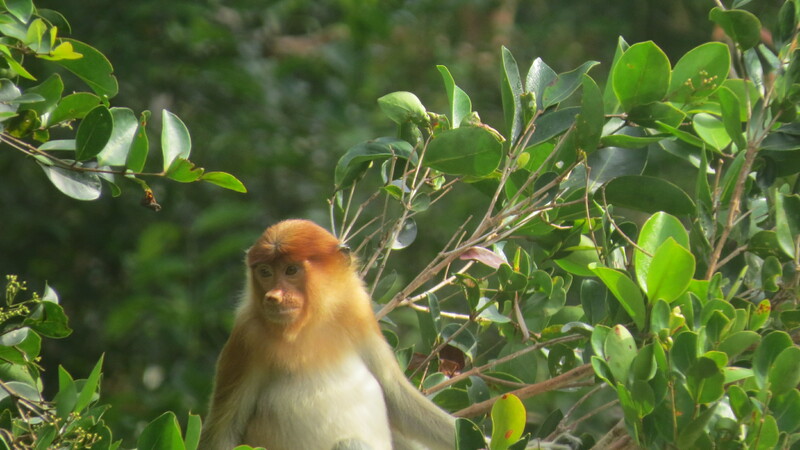 Camp Leakey and The Tanjung Puting National Park. 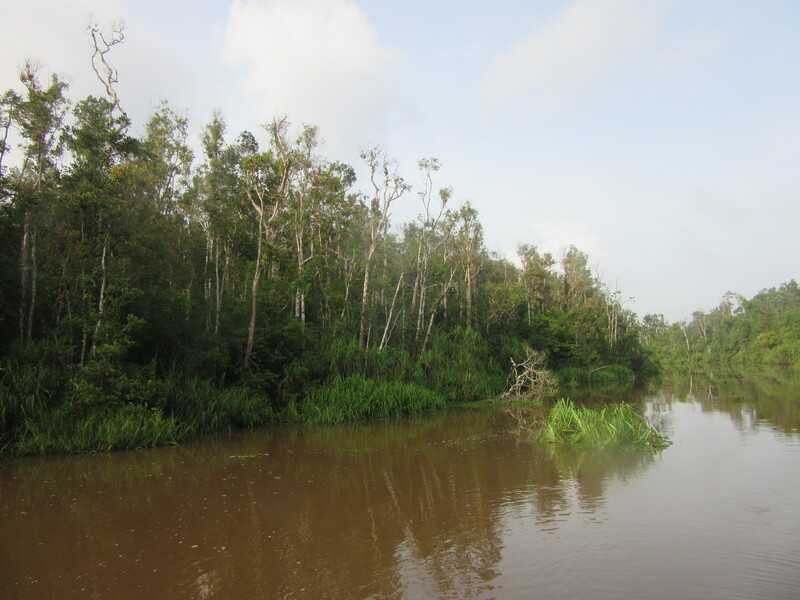 Chug chug chug, I’m on a very, very slow boat, or klotok, on a very muddy river (the Kumai) in Central Kalimantan, Borneo and you know, it’s just about perfect. We headed out of the port at Kumai and even after a few chugs we saw Fresh Water dolphins and a couple of Monitor Lizards. A little bit further and we turned off into a tributary, slow moving and very muddy, the entrance to the Tanjung Puting National Park. The mud is caused by illegal mining, mining for coal, zircon, gold and the rainforest is completely decimated. There is nothing left after the illegal logging was done and its now all palm oil and rubber plantations. No jungle sounds, no, birds, no butterflies, none of the usual whistling and hooting, no odd screeches. 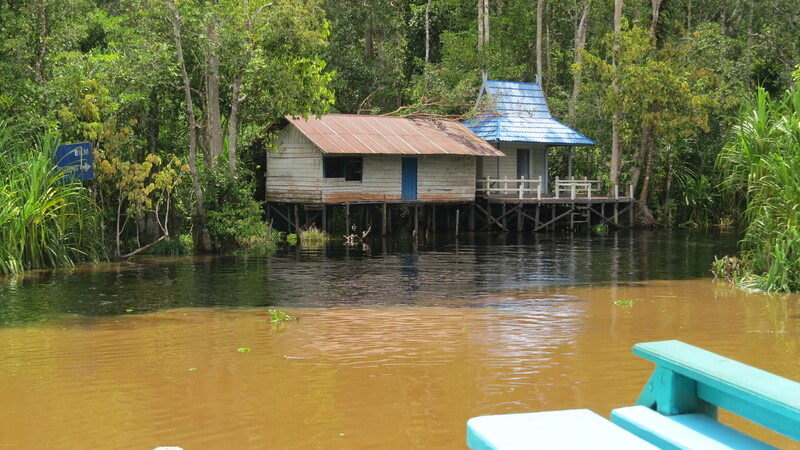 Even so it is still rather exotic, river, Borneo, klotok, I’m excited. Two hours of slow progress into the interior there was evidence perhaps that the illegal logging had been stopped or at least paused, there are trees, tall trees, stretching way, way away. 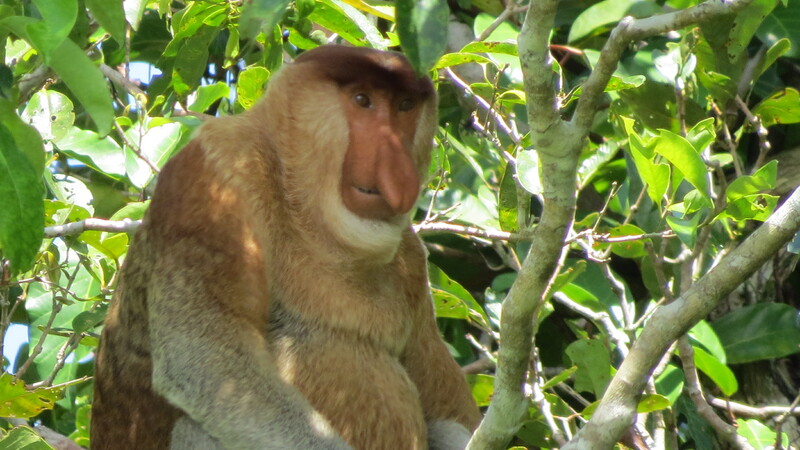 Straight away there were two bands of Proboscis monkeys swinging along the riverbank, two large males, both with multiple wives. 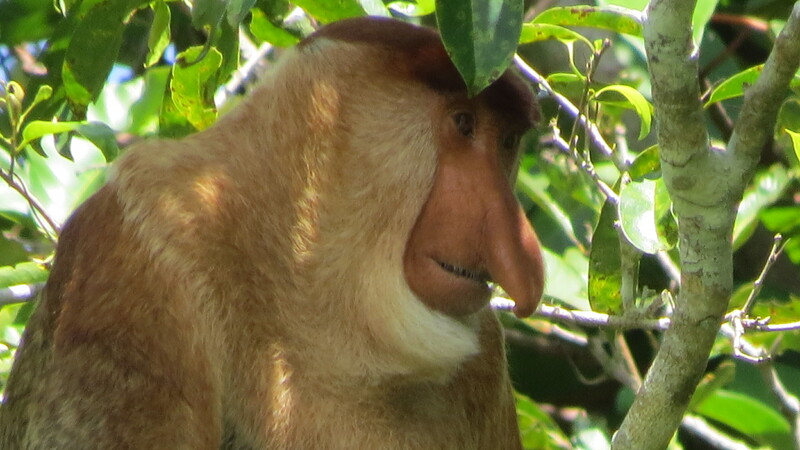 Finally I snapped a photo of a male, longer nose than the females, bigger too, plus I learned something new, with so many wives they are always erm ‘ready’! I laughed again and again, they leapt from branch to branch, high up and sometimes fell, plummeting down only to reach out casually with a hairy arm to save themselves. Why did I laugh? Just pure joy I suppose. On up the river and the sounds are back, whistles, hoots and that high pitched buzzing that you only hear here, in the jungle. 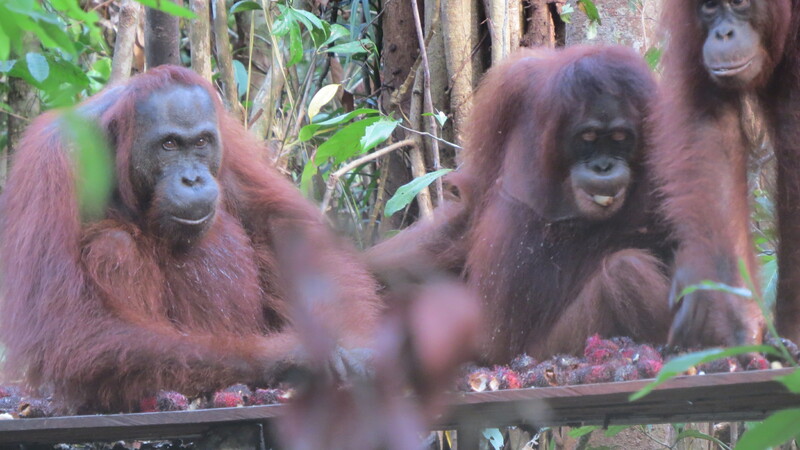 We stopped at a Ranger Station to watch the Orangutans be given their evening feed. Just a short fifteen minute treck through the trees and to a roped off area where there were, people. A number of people deep in the forest but where had they come from. Seems they had a big, group klotok, twelve I think, all Aussies, with an Orangutan expert in tow . The lenses on the cameras were something to behold, carried by youths who handed them over with the click of the fingers, the noise of the high speed shutters, irritating. 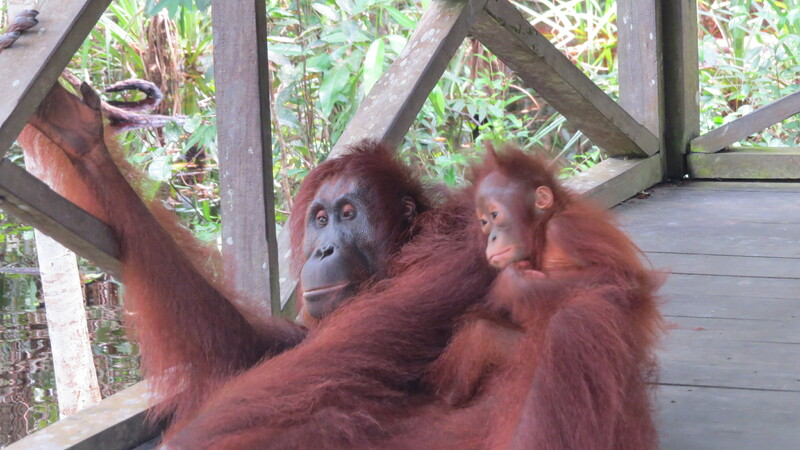 Yes we saw Orangutans, quite a few in fact and it was fantastic. Before this chapter closes here is something. 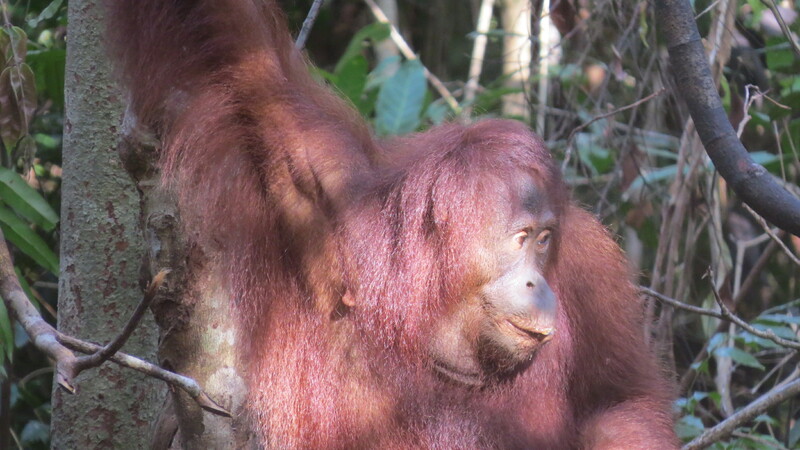 I casually mentioned to the guide that I wondered why they were called Orangutans, I got the look, the stupid tourist look. 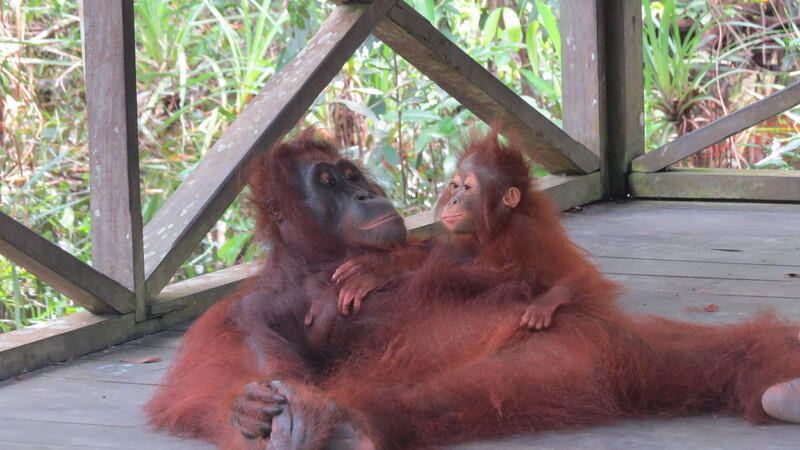 Orang in Malay means people, Utan means forest, therefore ‘people of the forest’ or Orangutan. That ends the four different spelling options. It’s a Malay word that we have somehow kept. Good for the Malays, good for us. We have parked for the night, beside the river, tied to a fallen tree. It’s pitch dark and I can’t see a thing. My bed is a mattress on the deck with a mozzie net. I’ll sleep well. Well I didn’t, not really. Too many crashes, growls, grunts and splashes kept waking me up but finally it was dawn at around five so I got up. We spent the day on the river, heading down another tributary where the water changed color dramatically, from the muddy brown of the mining detritus to the almost black of forest vegetation. Tall trees either side and us, puttering along on the klotok which is basically a small houseboat, primitive but utilitarian. There was a stop at a feeding station and like yesterday there where suddenly people where there had been none before. I met a Scottish couple, from Och on the Black Isle. No, I didn’t mention how appropriate was its name. He was from Lewis with the broad lilt of the Western Isles, she, Michelle was from Inverness but had been in Edinburgh for years and years. We had a nice chat, trashing the new tram (actually now its open it is quite good) and lamenting that Central Kalimantan is dry etc etc. A couple from Denver and another from LA, plus miscellaneous Spaniards. It seems that during the High Season here, June and July, the majority of the 60 or so klotoks available for rent in Kumai are taken by the Spanish and no one can tell me why. Anyone? (L?) Bit of a long way from Spain I’d have thought. Oops, I’ve wandered off, sorry. 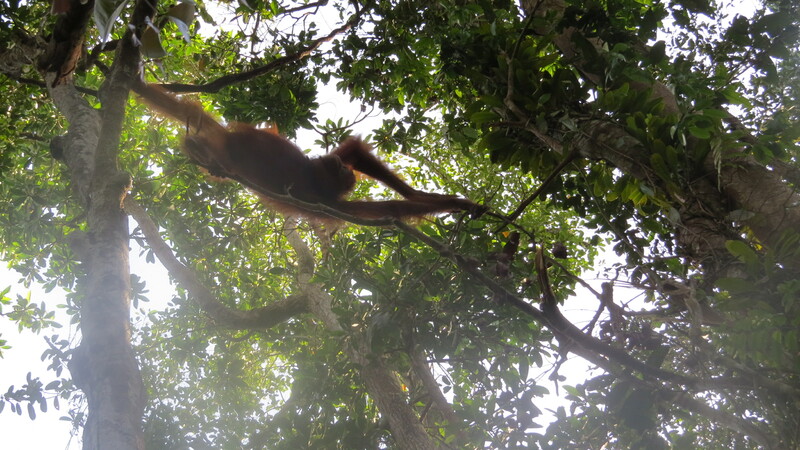 There were no Orangutans to be seen at the feeding station and we all trudged back to the river through an area reduced by slash and burn, just ferns grew. At the jetty on the river and at the Ranger station, two guys and a desk outside a hut, there were clouds of black butterflies, nowhere else, just where there were humans. Odd. To Camp Leakey then and when we pulled into the shore there was a Mom and baby just sitting on the fence, all nonchalant, as if greeting us. An unrelated male was fast asleep in the gazebo on the jetty. It was quite a miracle, but I think I have said enough about the Orangs though haven’t I? The river though, and the rainforest where, for me, the stars of the day. At one point I tried reading a book but couldn’t, I kept looking up and out, seeing the legend that is this green and verdant living thing. It can’t last, it really can’t and what kind of a tragedy that is and will be. One of the crew on the boat used to be an illegal logger and I got a few stories, via translation, that I found depressing. One cubic measure (20 centimeters) of the Iron Wood tree sells for $75.00, an Iron Wood sapling grows one foot every ten years, the loggers bribe the authorities so well that they build railways in the forest to ship the logs out. The local farmers are similarly destructive, slashing and burning vast areas for just one season’s crop, then they move on. I don’t have Internet access here but isn’t it well known that an area of the forest the size of a football field is destroyed every second? I told the guys on the boat, ‘enjoy it while its here’. Ok, rant over, no more tree hugging tonight, Birkenstocks back in the closet, pinko liberal flag furled, I’m going to have a beer and celebrate night number two on the edge of the Heart of Borneo. Sometimes the trees seemed full of wildlife. The muddy river and the Rainforest. 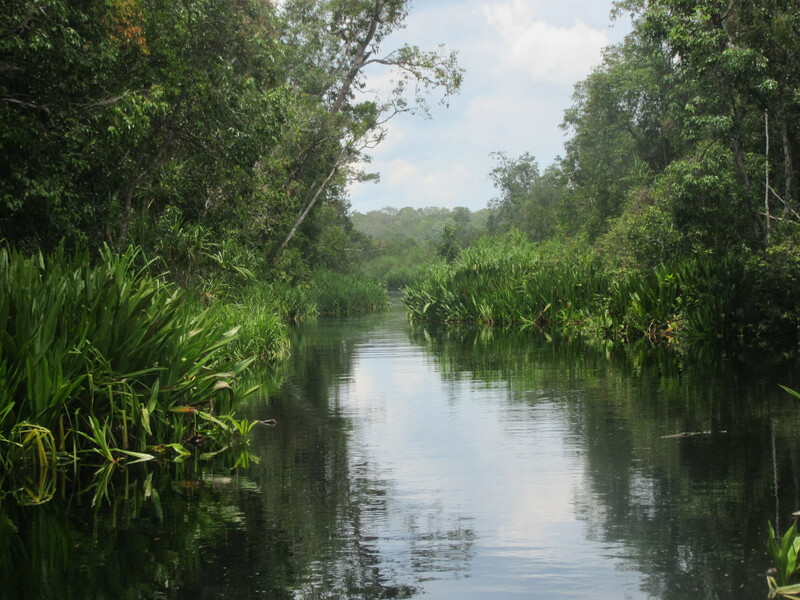 The black river and the rainforest. The black river meets the muddy river. Not sure how this one got uploaded! I hope its ok.
A male. What a handsome fella. She is kind of cute too. Even more adoring and adorable. 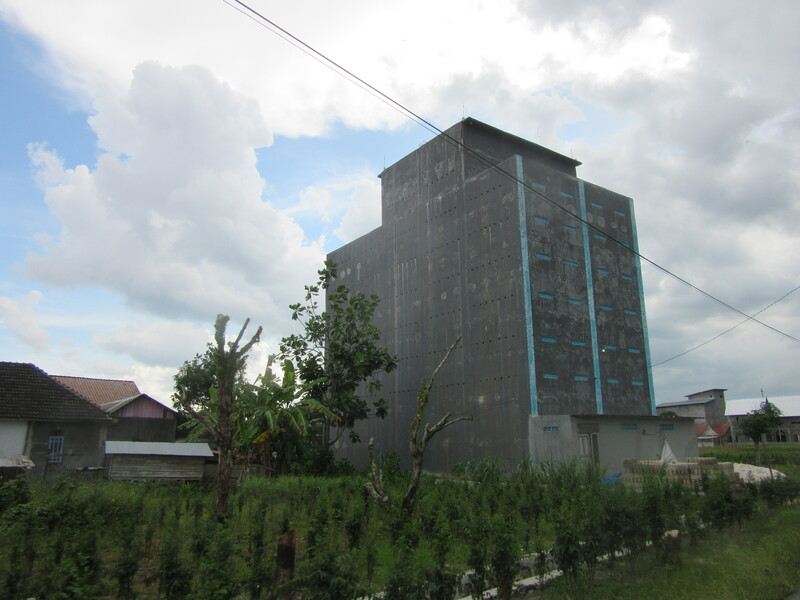 This is one of the dozens of bird hotels (swifts) in Kumai where the birds build their nests for Bird Nest Soup. Interesting I thought. I resolved before leaving that not only would I ‘live blog’ my trip but I would also take lots of photos. I did, but I have so many pictures that sorting the highlights has been difficult. I may do some more sorting and post more. I haven’t even looked at my phone yet! The photos on it I mean. 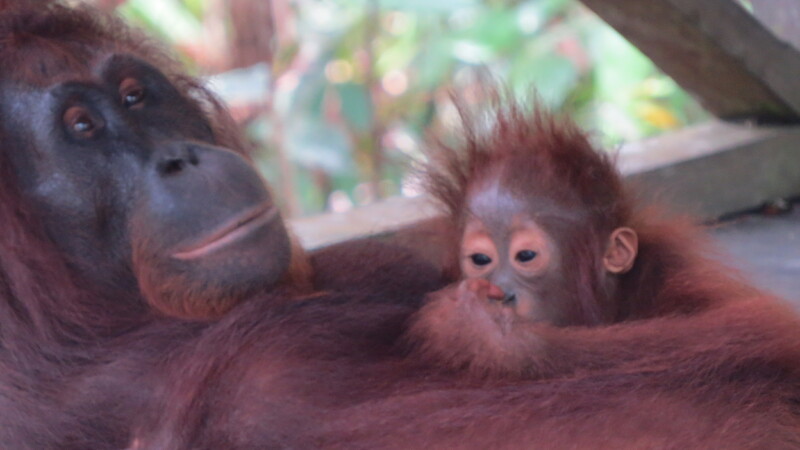 This entry was posted in Uncategorized and tagged Bird nest soup, Borneo, Camp Leakey, Kumai, Orangutans, Rainforest, Tanjun Puting National Park. Bookmark the permalink. Please send the recipe for Birdsnest Soup, sounds delicious! And thank you for the vivid descriptions of the tangs and sentiments about the rain forest. The only way I’ve seen to save it is to simplybuy the land, so they can’t do the slash and burn thing. I wonder how much an acre of land costs in Borneo? Thanks Anna, I got quite obsessed with the ‘bird hotels’. They are a major source of income along the river banks, transmitting amplified bird song to attract more customers. The swiftlets are quite happy with their protected accommodation so its a win win situation. Did I mention that nests sell for $100 per kilo. I wonder how much an acre of rain forest costs too. Another great blog – though mighty depressing, but we do need to be told, even though we know it happens; experienced by close friends makes it all the more realistic. Who do we blame? The locals? Big Biz? 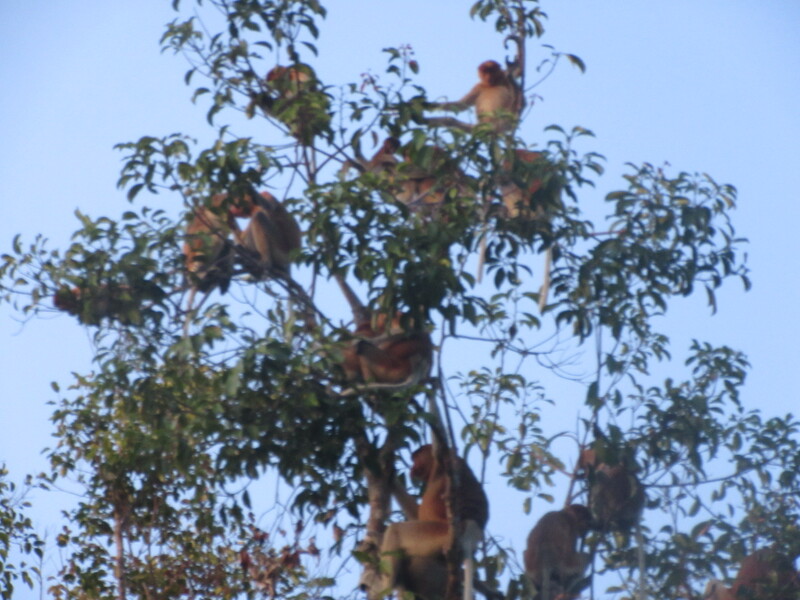 Perhaps we, the consumers… Anyway, great photos of the proboscis monkeys! And your description of the different moods of the river and its environs is so vivid. Love the monkeys and their noses. Terrible to see for yourself the destruction of the forests. I loved those monkeys too. Still travelling happily, though I am sometimes exhausted. A beach looms, I hope. Sorry for the delay in responding but I have been off the web for a while. I organized my klotok trip on arrival in Pankalanbun, or more precisely in Kumai which is where the boats leave from. This may or may not have been a good idea but at least I was able to reject the more outrageously overpriced thieves! The Lonely Planet guidebook has a few suggestions for a guide and klotok, though the first entry on the list apparently absconded with the deposit for a twenty person booking, never to be seen again. I will add to this when I catch up with my guidebook at the end of the week, I am in Bavaria and it is in Seattle! Be assured that the ride through the rainforest will exceed your wildest expectations, tying up to a tree for the night on the riverbank in the middle of nowhere remains a highlight of my adventures.